Words cannot express the excitement that filled my heart as I walked up to my porch and saw a little pink box hiding in my mail. Two words (maybe one?) 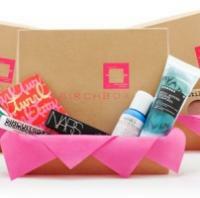 that make the middle of my month 100% happier: BirchBox. This is an absolutely genius company that has put together these special boxes that deliver a variety of hand-picked products, from lip and cheek stains, facial masks, ear buds, even designer Band-Aids, for $10/month. Crazy, right? I know people who spend $10/week on soda! $10/month for fabulous new beauty products to try each month? It’s a win win for everyone. You can influence the type of products that you receive by checking the things you like on their website: http://www.birchbox.com, but I genuinely LOVE not having a clue what is coming to me. The packaging of Birch Box is impressive, with its quality little box, and pink ribbon, AND makes opening it up all the more exciting. Clearly, I have a thing for packaging. Inside you will find products, with explanations of what each are, and what they are for. If you happen to want full size of any of your samples, you can hop on over to their site and order them! You also receive very cool perks like points, by referring friends, which turns into money you can use to purchase full size products! Another cool side of BirchBox is they also have an online magazine/blog, where you can read articles they have written about the hottest designer products, as well as very cool new and upcoming beauty companies: ALL FOR FREE. This month the site hosts articles directly written for BirchBox from Glamour Magazine; BirchBox teamed up with Glamour, whose July issue features the 5 senses. My BirchBox reads : See it, hear it, taste it, touch it, smell it. Yes, you guessed it, I received products to … see, hear, taste, touch and smell! So, the crowd consensus, well, my consensus, is that BirchBox is pretty much amazing, and now I have to leave you with this review to go dive into my little box of goodies. My recommendation? Apply for your membership now! You might be put on a wait list, and they will send you an invitation. I just happen to have a pretty cool editor who did all the hard work for me, and I get to enjoy all the benefits of this fabulous company. Tags: Atlanta, Atlanta Makeup Artist, Beauty Box Reviews, BIRCHBOX, Date Night Magazine, Hairstylist, Makeup, Makeup Artist, Makeup Reviews, Skin. Bookmark the permalink. I love Birchbox too! It’s so fun to receive a box of fun beauty products each month. I just posted the review of my April Birchbox on my blog :). Ah! I seriously need to sign up for it again! The editor of the magazine I write for purchased the 3 month subscription for me to review, and after it ran out, I never renewed it! I absolutely need to, because I am still in LOVE with it! Thanks for stopping by, and I will definitely have to check out your review!